This week is the bonhams entertainment sale, so I popped along to the viewing to see the Who-related items for myself. There is only one item relating the Tom Baker’s era: one of the original Mona Lisa paintings from City Of Death. Like the real thing the paint is done on wood board, but on this occasion cheap ply wood! It was hand painted and some of the brushwork is actually pretty good close-up. It was a shame the face doesn't really look like the real Mona Lisa! Pity the words This Is A Fake weren't visible . . . although there was some mysterious notes on the back (see right, bottom). Maybe it’s something to do with the Da Vinci Code? Or maybe not! The highlight of the viewing for me was to see first-hand the Sylvester McCoy TARDIS key, and to put my replica against it and see how it fared. The key was presented to me on a small navy blue velvet cushion (see right), awarding it the iconic place it now occupies! The most obvious difference between the original and the replica I have is the size! 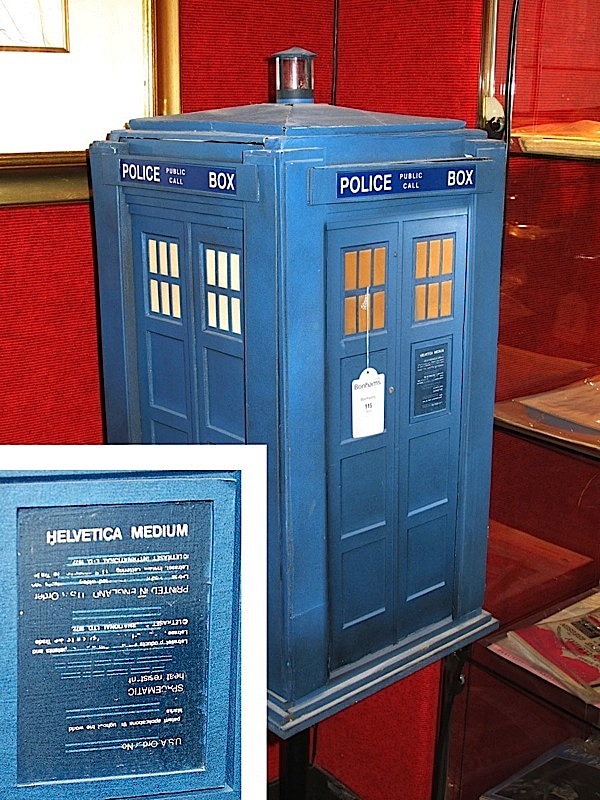 The replica is way bigger (see left). I’m not sure what the screen-used key was made from, but it was very lightweight, but quite rigid. It looks like metal, but I’m sure it’s not. My replica is really just a novelty key-fob, so is the same on both sides, whereas the original has a astronomical map on the reverse (see right). Overall there aren’t that many Doctor Who lots in the sale, but if you are a fan of the Peter Davison story Ressurrection Of The Daleks you are in for a treat! The catalogue lists two lots relating to the story, but each hides the number of items included in each. Lot 117 has even more! 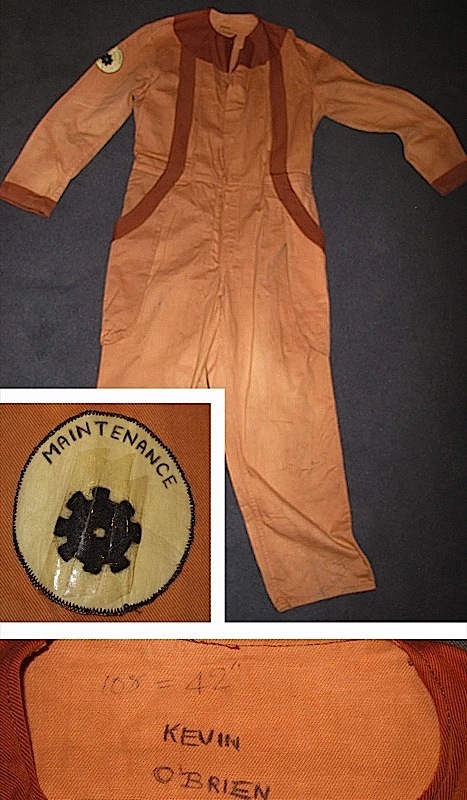 It contains an orange boiler suit with a Mantenance badge on the sleeve (see left) plus it’s matching orange hat (see below, left); a TWO khaki boiler suits, each with Operational badges on their sleeves (see below); another fibreglass helmet (see below); and a quilted vinyl jacket with metal rings across the upper half (see below). 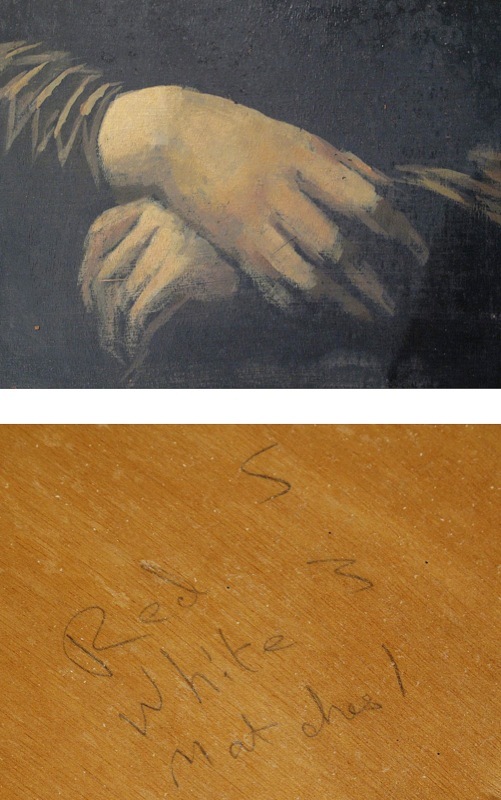 Both lots have an estimate of only £300-400, which really is a steal. I’d expect them to go for much higher on the day. 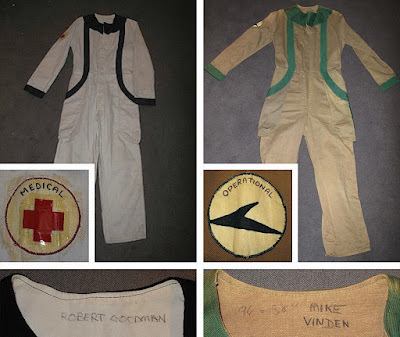 The thing that struck me the most was the sleeve badges, which these days would be properly made with stitched lettering and design. Although these have a stitched edge, the wording is hand written in ball-point pen and the logos are cut from felt! 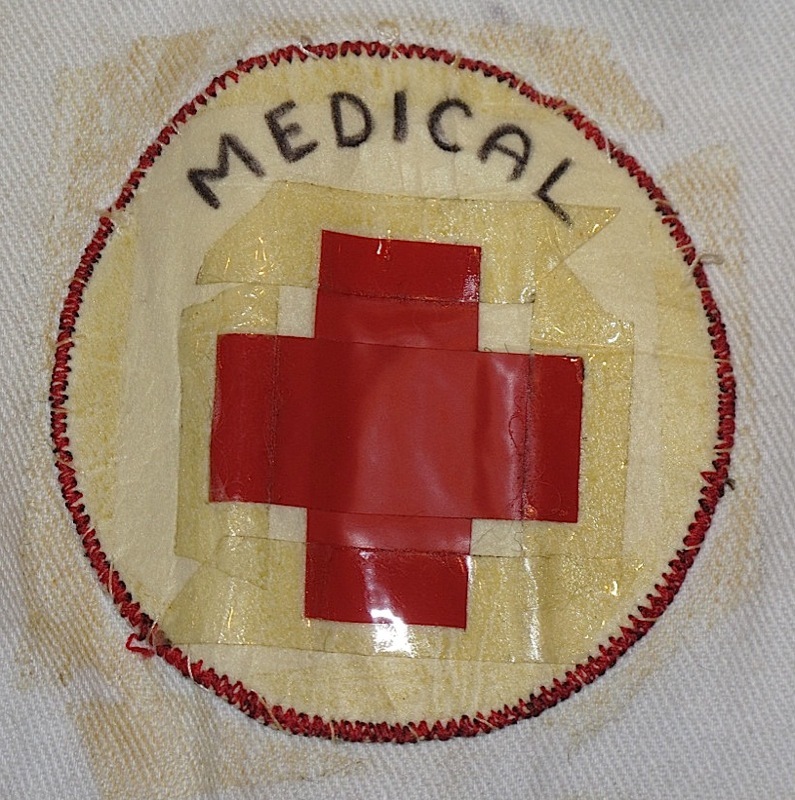 The red cross of the Medical badge is actual short bits of red gaffer tape!!!! I think I was expecting more from the collection of Dalek film posters, but essentially they were a batch of multiple copies of only three designs. The solitary Pertwee item, an Inverness cape, was a bit disappointing for me. 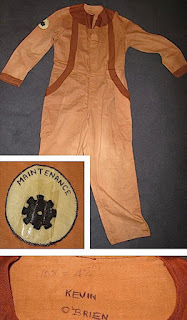 Although it had been worn throughout the final appearances of Jon in the role, it wasn't as well made as I thought it might have been. The cape part actually buttoned on, making it removeable. The herringbone fabric it was made from felt cheap and the lining was a simple viscose with a self-stripe and not the luxurious looking brightly coloured silks of the screen used ones. 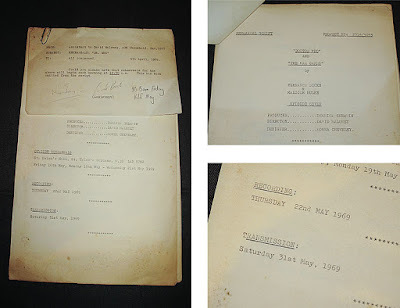 It was interesting to flip through an original rehearsal script for episode seven of the Patrick Troughton swan song, The War Games. 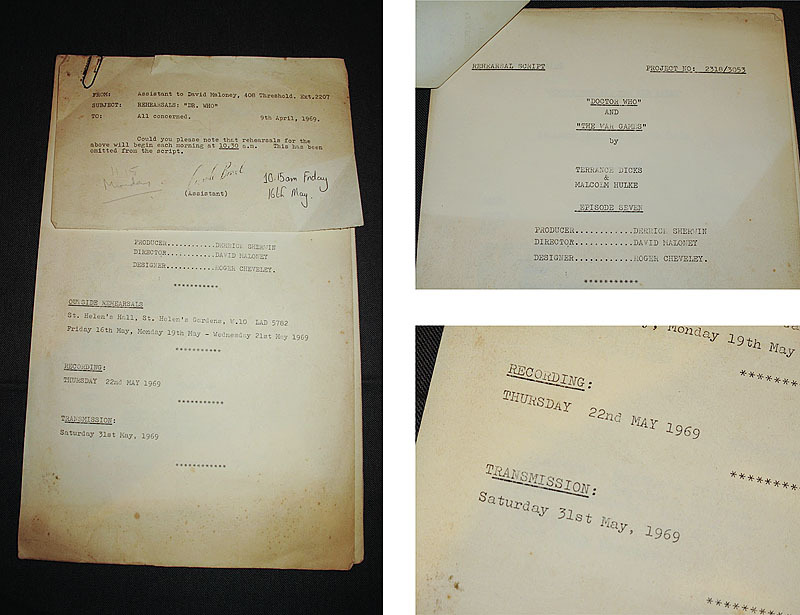 The first couple of pages outlined the rehearsal days, as well as the location filming needed for the telecine inserts. It gave the studio recording date as 22nd May 1969, as well as the broadcast date of 31st May 1969. 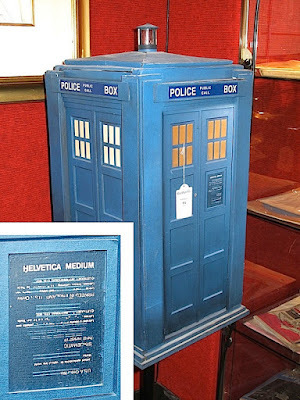 The final item I looked at was a model of the TARDIS built for ‘exhibition purposes’. 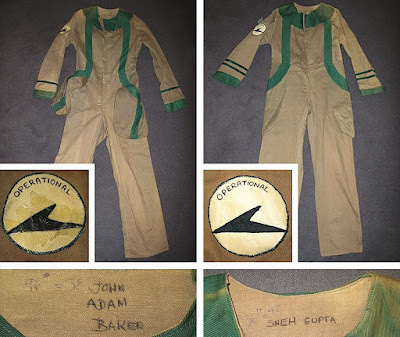 I gather it had been lot 138 of the 23rd June 2010 Entertainment Sale, but had to be withdrawn due to being severely damaged during the viewing. Now repaired, it did have one surprise I wasn’t expecting. Instead of the usual PULL TO OPEN panel, there was a paragraph (on he wrong side of the door to add insult) discussing the virtues of Helvetica Neue!!!!! I’d be curious to see what these items final achieve in the sale tomorrow. Once the result are in I’ll update the listing it wrote to include these figures, so check back once the hammer has fallen!